4pp., 8vo. Bifolium. 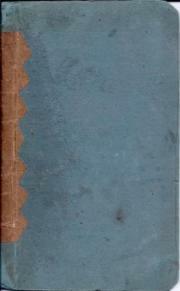 Heavily aged and worn, with closed tears at fore-edge of first leaf and at gutter. The first edition (an eight-page edition followed), originally bound into the third number of Bentley's Miscellany, of which Dickens was the editor. Drawing on his experience as a parliamentary reporter, Dickens parodies the State Opening of Parliament. At the end of the main text, in smaller type, he refers to the work which had begun serialisation in the magazine in February of 1837: 'NOTE OF THE REPORTER. pp., 12mo. Stapled. In green printed wraps with illustration on cover. In very good condition, very lightly-aged with slight rusting to the two staples. The thirteen Capricornus items on COPAC indicate that the press was connected with K. M. Briggs, or at least with her family, who had moved to Perthshire with their father in 1911. Uncommon. Copac lists sets of the three volumes in the series at the British Library, National Library of Scotland and Oxford, and a single copy of this number at the National Library of Wales. 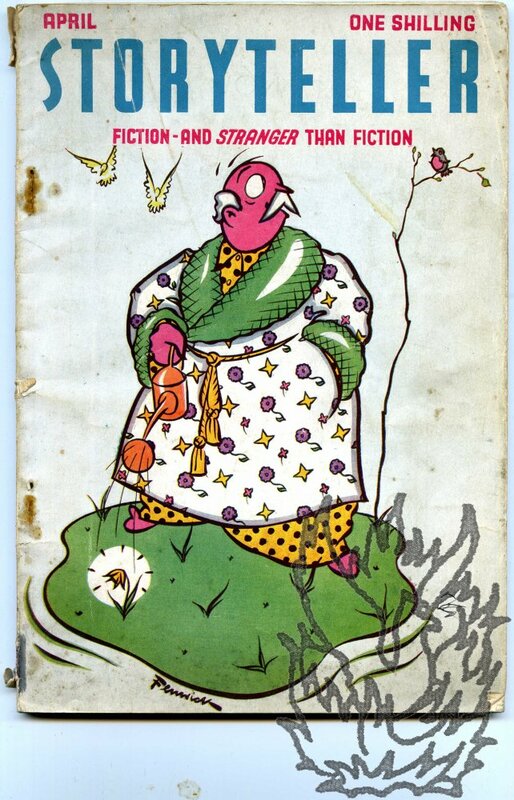 [Printed booklet by Elspeth Briggs, sister of the folklorist K. M. Briggs.] The Constant Gardener | A Play in One Act | By Elspeth Briggs'. Capricornus, Dunkeld, Perthshire. No date. 36pp., 12mo. In cream printed wraps with illustration on the front cover. In good condition, on lightly-aged paper with slight spotting to covers. The thirteen Capricornus items on COPAC indicate that the press was connected with K. M. Briggs, or at least with her family, who had moved to Perthshire with their father in 1911. Uncommon. Copies on COPAC at the British Library, National Library of Scotland, Oxford and Trinity College Dublin. [ Sir Robert Charles Kirkwood Ensor, journalist and historian. ] Autograph Letter Signed ('R. C. K. Ensor') to unnamed party, on Oxford University Fabian Society business, discussing the best time for a 'sober event'. 1p., 12mo. In fair condition, on lightly-aged paper.Reads: 'Dear Sir | The 19th May is out of it; becase it falls in Eights Week, which is an impossible time for any sober event – college concerts & dances per evening, with a vista of importunate relatives behind. | Fir the rest, the 26th is very much our best evening, if you can possible manage it without putting yourself to too great inconvenience.' See Ensor's entry in the Oxford DNB. [ Harold Coster, 'Photographer of Men'. ] Typed Letter Signed "Howard Coster", to Secretary of Authors' Syndicate Ltd, accompanied by typed list of his sitters, and brochure containing portraits of G. K. Chesterton, Algernon Blackwood, M. R. James,. Letter from 8 and 9 Essex Street, Strand, W.C.2. [ London ] 2 April 1930. The brochure containing portraits from the 'Supplement to 'The Bookman'" Christmas, 1929. The items are in good condition, lightly aged and worn, with slight rusting from a paperclip. ONE: TLS from Coster to the Secretary, The Authors' Syndicate Ltd., London. 2 April 1930. 1p., 8vo. [ Lord Muir Mackenzie, as Permanent Secretary to the Lord Chancellor. ] Three Autograph Letters Signed (all 'K. Muir Mackenzie') to Sir Richard Harington, with two long autograph drafts by Harington, all on the subject of County Court registrars. The five items in good condition, lightly aged and worn. ONE: Muir Mackenzie to Harington, 7 January 1897. 3pp., 12mo. Begins: 'Dear Sir Richard | The Lord Chancellor and his predecessors for many years have declined to sanction the appointment of joint registrars except in places where the amount of business requires two registrars; that is to say, if the business at Stourbridge is such as to require two Colles, it would still require a colleague for Colles Junr. [ Sir John Murray V, London publisher. ] 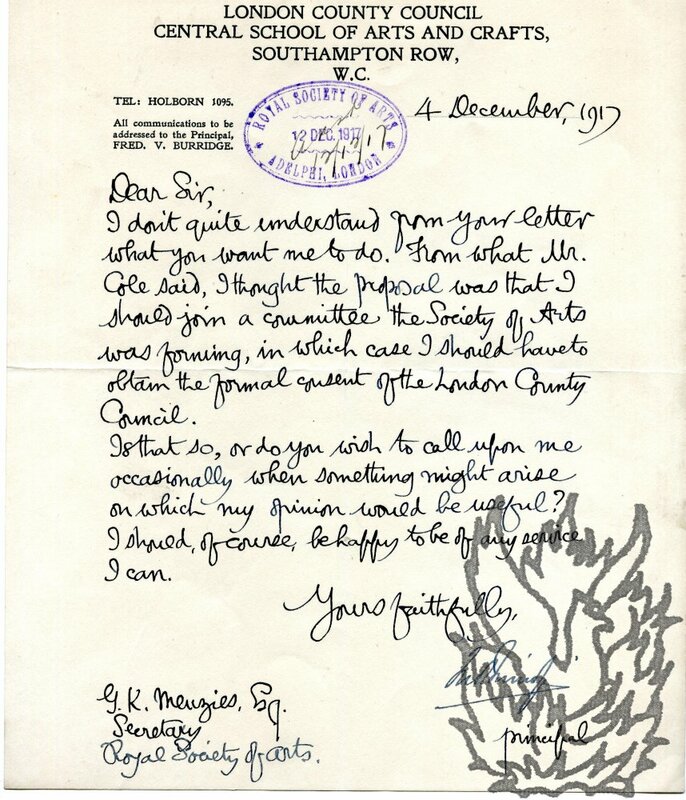 Autograph Letter Signed to [ G. K. Menzies ] the Secretary of the Royal Society of Arts, discussing his deafness on declining an invitation to a discussion. On letterhead of John Murray, 50 Albemarle Street, London W.1. 20 February 1939. 1p., 8vo. In good condition, lightly aged. He thanks him for the invitation to the Society's 'discussion on extended copyrights'. He must decline, not only because of a prior invitation, 'but also because I am unfortunately too deaf to take any satisfactory part in debate or discussion, as I miss so much that is said & get some of the rest wrong!' His infirmity is 'a bar to my pleasure on such occasions'. [ Printed pamphlet. ] Special Collections of Local Books in Provincial Libraries. 32pp., 16mo. In grey printed wraps. In good condition, on lightly-aged paper, in aged and worn wraps. Nicely printed. The only copies on COPAC at the British Library and Oxford. Series of ten printed handbills by Mrs. Humphry Ward, on behalf of the Unionist Party in the General Election of 1910, under the title 'The Coming Election | Letters to My Neighbours | by | Mrs. Humphry Ward'. Addressed from 'Stocks, Aldbury, Tring. ', and dating from between 10 and 17 January 1910. 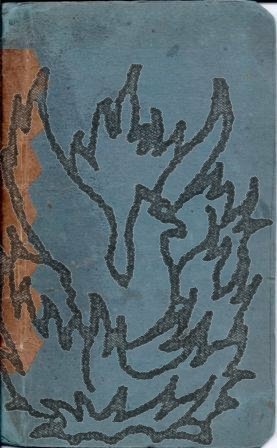 Published by Smith, Elder, & Co, London, and printed by Spottiswoode & Co. Ltd, London. A total of 41pp., 4to. 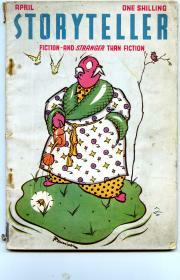 Complete run of ten issues (a second edition, expanded to 63pp., appeared in the same year). In black cloth binding, with manuscript note on front pastedown: 'George H M Ricketts - | Lent to Mr Blackman with a hope that he will read it & circulate it amongst his friends.' Eight of the ten numbers are of 4pp. ; one (no.4) is of 6pp; and another (no.10) of 3pp. Uniform in design and all printed in blue ink. [ Oxford Women's Colleges in the late Victorian period. ] Four numbers of 'The Fritillary', a magazine for the Oxford women's colleges, edited by future novelist D. K. Broster. Oxford. No. 3: December 1894. No. 4: March 1895. No. 6: December 1895. No. 14: June 1898. The first three numbers 'Printed for the Proprietors by Alden & Company, Ltd., Bocardo Press', the last printed 'by James Parker & Co., Crown Yard'. All four numbers in good condition, in original grey printed wraps. Totalling 79pp. (No. 3 paginated 23-46; No. 4 paginated 47-66; No. 6 paginated 85-108; No. 14 paginated 221-231). Broster is named as editor of the last number, the others giving no information.. For more on the magazine, see Kristin Ewins, 'A History of Fritillary: A Magazine of the Oxford Women's Colleges, 1894–1931', Notes & Queries, 2008. [ Raphael Tuck & Sons Victorian christmas card. ] Coloured Christmas card with illustration by 'E M W' on one side, and poem by 'SAMUEL K. COWAN M.A.' on the other. On a gilt-edged piece of card, 13 x 11.5 cm., with rounded edges. In good condition, lightly aged. The illustration by 'E M W' on one side is printed in silver, yellow, light blue, grey and brown, and shows a snowy country scene with two tiny figures beneath a shining sun on a stone bridge over a stream. Captioned 'The Joy of Christmas be in your heart.' Cowan's eight-line poem, on the other side, is printed in grey, in variety of gothic fonts. It begins: 'Only its best and brightest history | May Memory relate you! [ Society for the Study of Social Ethics, Oxford. ] Six items, including 'The Idea of a Modern Ethical Society' by W. K. Firminger and W. Gibson, pamphlets on religion, over-population and immigration, and offprint of lecture on 'the poor'. Society for the Study of Social Ethics, Oxford. 1891 and 1892. The six items are all disbound and in fair condition, with light signs of age and wear. Items One and Five are not productions of the Society, but are closely connected with it. The first five items are scarce: the only copies of One on COPAC at Oxford and the British Library; no copy on COPAC of Two; the only copies of Three and Four at Oxford; Five is a galley proof; and Six only to be found at Oxford, the British Library, the LSE and University College, London. ONE: 'The Idea of an Oxford Modern Ethical Society. Printed Victorian Christmas card with the poem 'Christmas Greeting' by 'S. K. Cowan M.A.' on one side, and a coloured chromolithographic illustration by J. N. Drummond on the other. On a thick piece of shiny card, with rounded edges, 12.5 x 18cm. Aged, and with two dog eared corners and a 3cm closed tear (not affecting illustration). On one side is the chromolithographic illustration, with 'J. N. Drummond' in the bottom right-hand corner, showing an English rural landscape - more autumnal than winter - with river in the foreground and trees and viillage with church in the background. [ J. A. Spender, editor of the Westminster Gazette. ] Autograph Letter Signed ('J. A. Spender') to 'Mr. Murdoch', regarding his admiration for G. K. Chesteron, but puzzlement that, as a 'Mediaevalist', he should wish to stand as a Liberal candidate. On letterhead of Chantry Place, Marden, Kent. 19 July 1925. 1p., 4to. On aged and browned paper, chipped at extremities, but with the 30 lines of text intact. Without place or date, but after the demise of the 'New Witness' in 1923, and before G. K. Chesterton's death in 1936. 3pp., 4to. In fair condition, on aged, worn and browned paper. Ada Chesterton worked with her brother-in-law while assistant editor of the 'New Witness'. Her admiration for his talents was fully reciprocated, G. K. Chesterton describing his sister-in-law as 'brilliant'. It begins: 'Very much has been written and said of G. K. C. the poet, the pamphleteer, the genius of paradox, who holds the attention of his listeners by his dazzling sleight of words. I am going to write of him from a different angle - G. K. C. the journalist as he is known and gauged in Fleet Street. [Mimeographed pamphlet alleging that Aristotle Onassis was behind the assassination of President John Fitzgerald Kennedy.] A Skeleton Key to the Gemstone File. Credit will go where credit is due after the mess has been cleaned up. 16pp., foolscap 8vo. Stapled into white printed covers, with 'ransom note' design on front and facsimile on back of letter from the Warren Commission members to the President of the United States, 24 September 1964. Very good, on lightly-aged paper. The document ends, under the publication details on the last page: 'Meanwhile back at the peanut farm: A PRESIDENT FOR AMERICA | The difference between Gerald Ford and Jimmy Carter is one of style and personality. Theirs [sic] policies are remarkably similar. | The Economist Oct.
A signed 'True Copy', in manuscript, of a letter of recommendation from Captain D. W. K. Barr, 'Pol[itical]: Ag[en]t Baghelkhund [Bagelkhand] & Superintendent of Rewah [Rewa]' to 'The First Assistant to the Agent Governor General for C. J. Indore'. Letter, on Government of India letterhead, dated from the 'Baghelkhund [Bagelkhand; Baghelkhand] Agency, Sutua; 31 July 1883. 3 pp, folio. Text clear and complete. Good, on lightly-aged paper. Supporting the application of 'Surgeon [Charles] Lowdell, Officiating Agency Surgeon Baghelkhund, [sic] applying for the Acting Appointment of Medical Officer in Charge Bhopal Battalion in the event of a vacancy occurring in October next'. Lowdell is holding his current post while Surgeon Goldsmith is on furlough, and on his return will be without an appointment. 'His duties in connection with the special charge of the young Maharaja have been difficult and have required the exercise of tact and patience. The History and the Mystery of Good Friday. By Robert Robinson, of Cambridge. A new edition, corrected. To which is added, A Brief Account of the Life and Writings of the Author. Printed for and sold by J. Marshall, Bookseller, Gateshead. Sold also by the Booksellers in Newcastle, Shields, Sunderland, Durham, &c. and Longman, Hurst, and Co. London. K. Anderson, Printer, Newcastle. 1805. 12mo, 48 pp. Text clear and complete. Fair, on aged paper. Rebound in the twentieth century in worn workmanlike blue wraps, with the outer edges of the pamphlet rounded off. The text of the work covers pp.3-40; with the 'Brief Account' on pp.41-48. A scarce piece of provincial printing: no copy in the British Library or on COPAC, and the only copy on WorldCat at the New York Public Library. 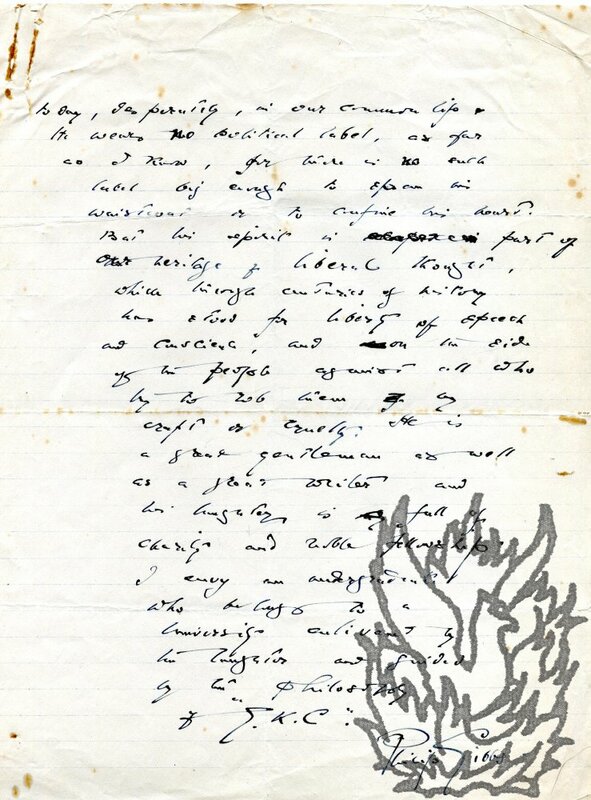 Autograph Letter Signed ('H Belloc') from a sixteen-year-old Hilaire Belloc to his childhood sweetheart Minna Hope, describing in detail how 'matters' have 'come to a scarcely endurable crisis'. 13 October 1886. On letterhead of The Oratory, Edgbaston, Birmingham. 12mo, 6 pp. Bifolium and single leaf. Text clear and complete. Fair, on aged and lightly-creased paper. Closely and neatly written. 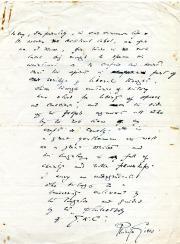 An important and revealing letter, written while Belloc was still at school. Vol. I. No. 6: April 1937. London: The Amalgamated Press, Ltd.
4to, 112 pp. Stapled. In original printed wraps. Fair, on aged and lightly-discoloured paper. In creased, worn and discoloured wraps. 'Arctic Hunter' by Shackleton covers pp. 33-38. With four photographs (three captions: 'A Herd of Musk-Oxen', 'An Arctic Switch-Back' and 'Eskimos in their Hunting Kayaks'). Shackleton's article reads as an original not an extract. Begins 'THE Arctic is thought by many to be a dead and sunless world, largely devoid of life. One Signed Letter, in the hand of a secretary, four Typed Letter Signed and two Typed Notes Signed (all seven 'Fred Burridge') to G. K. Menzies, Secretary, Royal Society of Arts. All seven items 4to, 1 p. Each docketed and bearing the stamp of the Royal Society of Arts. All good, on lightly-aged paper. The first is in a secretarial hand, with the other six all typed. Item One: 4 December 1917. He doesn't 'quite understand' from Menzies' letter what it is that he wants him to do. 'From what Mr. 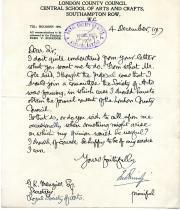 Seven Typed Letters Signed (one 'Charles Allom' and the other six 'Chas. 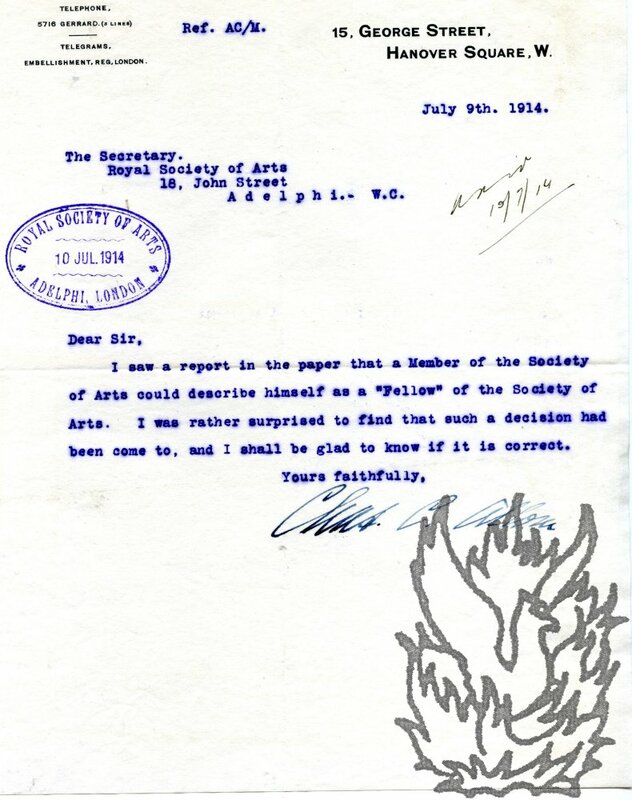 C. Allom') to various secretaries (Wood, Menzies and Perry) of the Royal Society of Arts. 1914, 1916, 1918 and 1921; all on letterhead of 15, George Street, Hanover Square, London W.
All seven items 4to, 1 p. Each good, on lightly-aged paper. All bearing the Society's stamp, and six docketed. Letter Two to Sir Henry Trueman Wood, Three to Six to G. K. Menzies, and Seven to W. Perry. Letter One: 9 July 1914. Querying whether members of the Society can describe themselves as 'Fellows'. Letter Two: 22 March 1916. Being 'unable to get an earlier passage [to America] owing to cancellation of boats', he will be delighted to preside over a meeting. Signed Autograph Manuscript testimonial ('Philip Gibbs') on behalf of G. K. Chesterton's candidacy for the Rectorship of the University of Glasgow. 8vo: 2 pp. Fifty lines. Text clear and complete, on two pieces of aged and spotted paper, with rust spots from paperclip. Untitled. Begins: 'I should like to see Chesterton as Lord Rector of a university which stands for Liberal thought. Some people, limited in imagination and hostile to unconventional character, would as soon give their votes to a modern Don Quixote who by some miracle has acquired the corporeal structure of his own Sancho Panza. Typed Letter Signed ('Ian Hay Berth') to J. Gordon Murdoch, on the subject of G. K. Chesterton's candidacy for the Rectorship of the University of Glasgow. 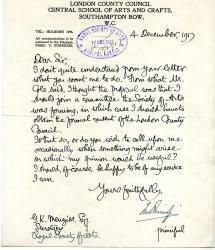 13 July 1925; on letterhead of 21 Bruton Street, Berkeley Square, W.
Autograph Letter Signed ('J. J. Bell.') to J. Gordon Murdoch, regarding G. K. Chesterton's candidacy for the Rectorship of the University of Glasgow. 28 August 1925; St Leonards Cottage, St Andrews, on cancelled letterhead of 1 Oakfield Avenue, Hillhead, Glasgow. 12mo, 1 p. Twelve lines. Good, on lightly-aged paper. He has had Murdoch's letter 'lying by me in the hope that I might meet someone here who knew G.K.C., or knew his work well enough to tell me something of interest - for, alas, I must confess to ignorance'. As he has not been 'fortunate', he abandons 'hope of contributing to your Rectorial Magazine'. Murdoch edited the magazine 'G.K.C.' in support of Chesterton's unsuccessful candidacy. Autograph testimonial on behalf of G. K. Chesterton's candidacy for the Rectorship of the University of Glasgow. Two foolscap (32.5 x 20.5 cm) pages. Seventy-three lines of text. On two pieces of aged paper, with wear at head and foot. Text clear and complete. A witty and light-hearted endorsement of Chesterton's candidacy, beginning 'Rumour reaches me that my name & my past misdeeds h[ave]. b[ee]n astonishingly flung into the Rectorial arena. Things that I said in my haste or my leisure long years ago about the candidates [Chesterton, Chamberlain and Webb] h[ave]. b[ee]n. dragged into the light to exalt this one & prejudice that. [...] Mr. Chamberlain's presence is sufficient & Mr.